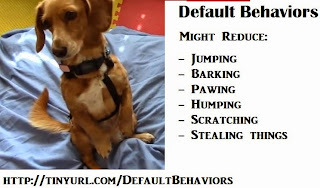 Default behaviors are a great way for our dogs to learn how to communicate with us. Find some behaviors that are simple for dogs to do (like "sit") and reward that behavior a lot. Pretty soon, our dogs will learn that performing the default behavior will get them things that they want. "Puppies enthusiastically learn about default behaviors and this becomes the foundation of their understanding that they can use their behavior to influence your behavior"
"Teach your dog some default or automatic behaviors (my primary ones are eye contact, sit, and down). Whatever behaviors you reward the most will become the defaults. I always wait for my dogs to give a default behavior before I give them dinner, let them out of a crate, or do anything else they are going to enjoy." "Choose a default behavior. Practice multiple times over the course of several days until the dog is offering the behavior quickly and reliably."